Manage Your Accounts Easily on the Bing Ads App with Add Funds & Multi-User Access Releases . Add funds on the go for prepay accounts and view accounts across different customers with multi-user access. Help save time and manage your campaigns more efficiently with new search functionality. 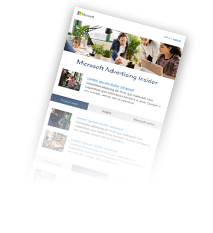 Take advantage of opportunities while on the go to help keep your ads from not showing as often as they can due to campaign budget limitations. Learn how the new account level association for extensions can help save you time, help provide consistency across advertising platforms, and help improve CTR of your ads. As previously announced, we stopped serving ads in the content network on June 30th, 2017. While the content network was deprecated, you still have content ad groups with content bid settings and content keywords in your accounts. Consequently, to ensure that your accounts contain only the most relevant entities that contribute to your advertising efforts and deliver a return on your investment, we are planning to cleanup data related to the content network that is no longer relevant on November 30th, 2017.